ClubHotel Riu Ocho Ríos offers 856 guestrooms spread among 3 buildings that all include a balcony with an ocean view, separate sitting area, minibar, liquor dispenser, complimentary bottled water, and central air conditioning. 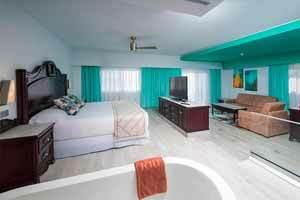 In the Deluxe Jacuzzi Suites at the ClubHotel Riu Ocho Rios, you're going to enjoy an unforgettable stay with the best exclusive amenities for you. These 69-m2 rooms are equipped with the best amenities, like a king-size bed (200x200 cm), a sofa in the lounge area, a dressing room, satellite TV, air conditioning, a minibar and beverage dispenser, and an indoor hydromassage bathtub. Plus, in these suites with a sea view, you'll find a magnificent terrace with a jacuzzi for relaxing in the sea breeze. At the ClubHotel Riu Ocho Rios we offer Lateral Sea View Double rooms, 28-m2 rooms equipped with everything you need for your holiday. 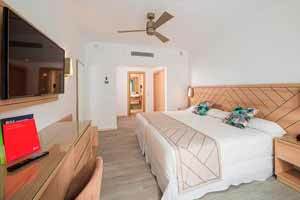 In these rooms, you'll find two small double beds (125x200 cm) or one king-size bed (200x200 cm), satellite TV, air conditioning, a minibar and beverage dispenser, and a balcony or terrace. If you want to enjoy a holiday in Jamaica with the best services and amenities, the Deluxe Sea View Suites at the ClubHotel Riu Ocho Rios are the perfect option. These 69-m2 rooms have a king-size bed (200x200 cm), a sofa in the lounge area, a dressing room, satellite TV, air conditioning, a minibar and beverage dispenser, a balcony or terrace, and a hydromassage bathtub, everything you need to enjoy an unforgettable escape. * If you stay in our Deluxe rooms, you'll enjoy exclusive services like independent check-in and free WiFi in the Junior Suites and Suites. 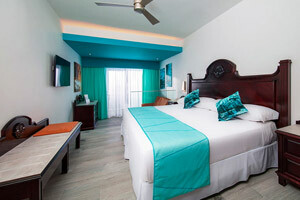 The Deluxe Sea View Junior Suites are 34-m2 rooms equipped with the best amenities. 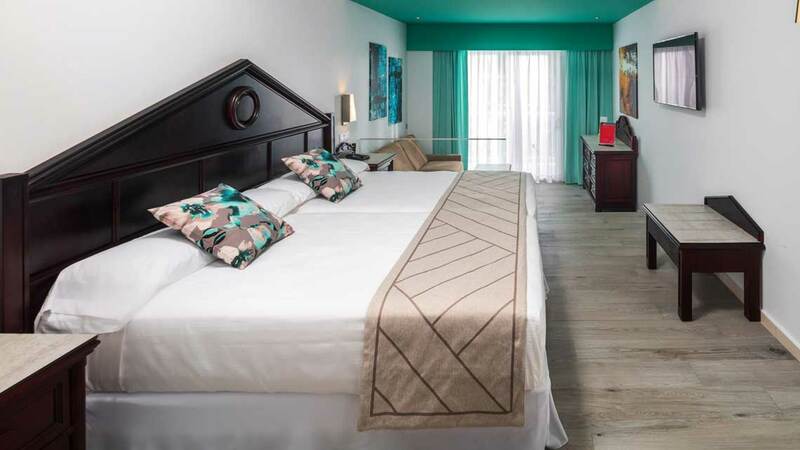 In these rooms at the ClubHotel Riu Ocho Rios, you'll find one king-size bed (200x200 cm) or two small double beds (125x200 cm), a sofa in the lounge area, satellite TV, air conditioning, a minibar and beverage dispenser, a balcony or terrace, and a hydromassage bathtub to relax in. * If you stay in our Deluxe rooms, you'll enjoy exclusive services like independent check-in and free WiFi in the Junior Suites and Suites. The Frontal Sea View Deluxe Junior Suites are the perfect accommodations for people who want to enjoy a holiday with views of the Caribbean. 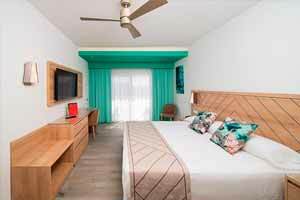 These 34-m2 rooms at the ClubHotel Riu Ocho Rios have one king-size bed (200x200 cm) or two small double beds (125x200 cm), a sofa in the lounge area, satellite TV, air conditioning, a minibar and beverage dispenser. Plus, you'll be able to relax in the hydromassage bathtub or enjoy the sea breeze on the balcony or terrace. * If you stay in our Deluxe rooms, you'll enjoy exclusive services like independent check-in and free WiFi in the Junior Suites and Suites. 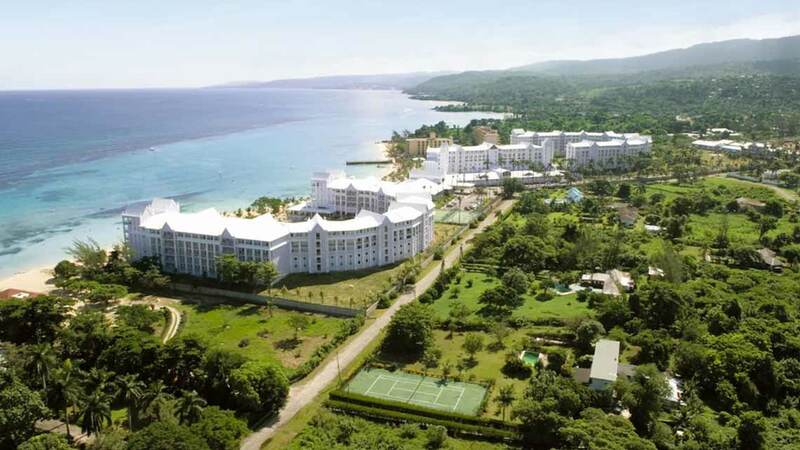 These 28-m2 rooms are the perfect accommodations for enjoying your holiday in Jamaica. 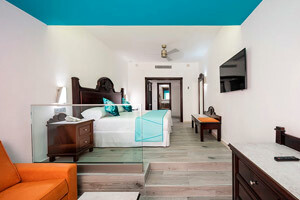 The Sea View Double rooms at the ClubHotel Riu Ocho Rios have two small double beds (125x200 cm) or one king-size bed (200x200 cm), satellite TV, air conditioning, a minibar and beverage dispenser. Plus, all of them have a balcony or terrace for you to enjoy the views of the Caribbean. The Double Standard accommodations at the ClubHotel Riu Ocho Rios are 28m2-rooms that are perfect for enjoying a holiday in Jamaica. 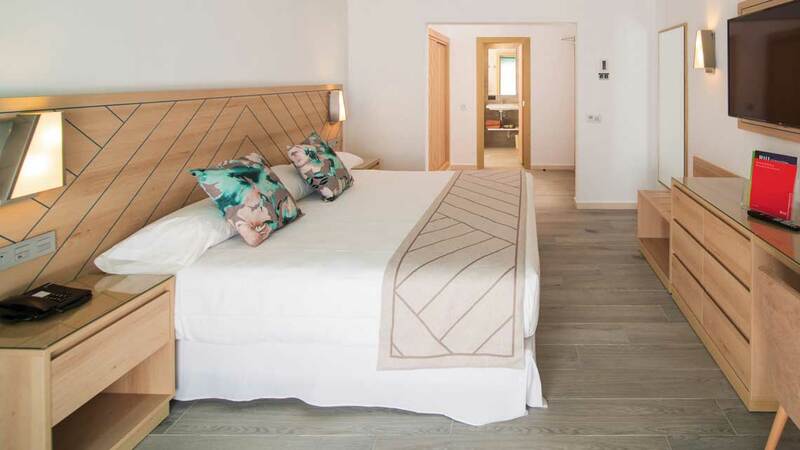 Each of these rooms has two small double beds (125x200 cm) or one king-size bed (200x200 cm), satellite TV, air conditioning, a minibar and beverage dispenser, and a balcony or terrace to give you everything you need on your holiday. 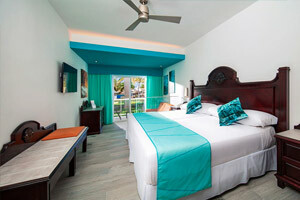 These 34-m2 rooms at the ClubHotel Riu Ocho Rios have everything you need for an unforgettable escape to Jamaica. 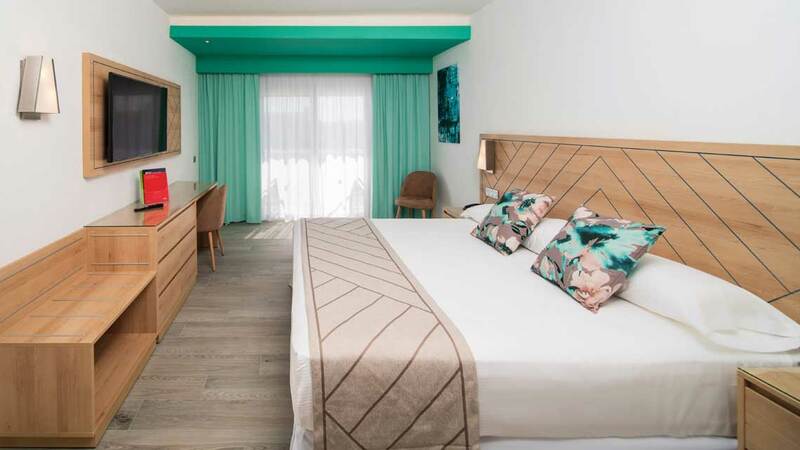 In the Deluxe Garden View Junior Suites, you'll find one king-size bed (200x200 cm) or two small double beds (125x200 cm), satellite TV, air conditioning, a minibar and drink dispenser, and a balcony or terrace with views of the hotel gardens. Plus, these rooms have a hydromassage bathtub for you to relax to the utmost. * If you stay in our Deluxe rooms, you'll enjoy exclusive services like independent check-in and free WiFi in the Junior Suites and Suites.